If you fancy learning more about how synths work — and obtaining a cheap Moog into the bargain — the Werkstatt ø1 could be just the thing. A week before Moogfest 2014, I arrived at Moog Music’s factory in Asheville to test a rather large synthesizer, and was surprised to find many of the staff almost equally excited about something considerably smaller. They asked me what I thought of it. Visually, it wasn’t much, just a small pressed steel case with a few potentiometer shafts, even fewer switches, some sort of header on one side, and 13 tiny buttons arranged in the shape of a keyboard pushed through the top. It lacked any legends, but they shoved a printed crib–sheet under my nose so I adjusted the oscillator, filter and contour generator to what might have been sensible values and pressed one of the little buttons to produce a note. I hadn’t expected much, but the sound that emerged had no right to do so, and I said as much. Surrounded by grinning Moogies, I proceeded to experiment, and was soon producing some rather pleasing sounds that clearly met with their approval. I asked what it was, and they told me that it was the prototype of a ‘kit’ synth designed as an educational tool to be built by the Engineering VIPs during Moogfest. Of course, it was to have a fancier case replete with legends to explain what was what, and Moog’s engineers would be on hand to ensure that everyone who built one would go home with a working synthesizer but, at the time, that seemed to be the limit of its (and their) ambition. 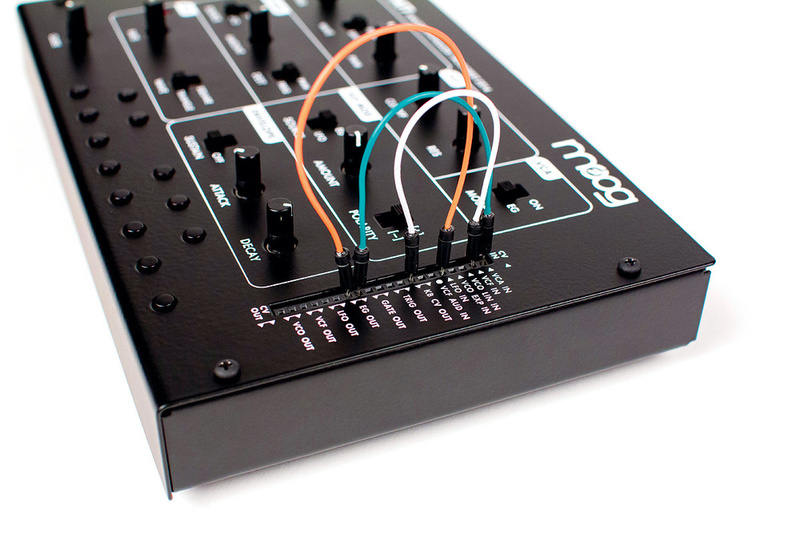 A few days later, I was fiddling with the prototype again, and I suggested to Moog’s product marketing manager that the company would be bonkers not to release the little box as a commercial product. There followed a rambling discussion regarding manufacturing and distribution costs, its potential appeal (or not) to the synth market as a whole, whether it required a breakout box and, to quote the Hitchhiker’s Guide To The Galaxy in both words and spirit, what colour it should be. I later learned that the same discussion was held many more times elsewhere and a few months later, to Moog’s great credit, the company responded to what its customers and fans requested. So here it is — the product that was never intended to be — the Werkstatt ø1. Like its progenitor, the commercial version of the ø1 is a kit, but it’s a very different type of kit. Whereas the circuit board supplied at Moogfest was already populated with its surface–mount devices, the attendees still had to solder nearly 200 component legs to the board and, in doing so, were taught much about its underlying electronics. In contrast, today’s version is cut from the same cloth as last year’s Korg MS20 Kit; the board is already fully populated, and the assembly instructions are no more complicated than building the simplest of Meccano models. The result is a neat unit that offers a single but wide–ranging VCO generating sawtooth and pulse/PWM waves, a 24dB/oct resonant/self–oscillating low–pass ladder filter and a VCA with permanently On (drone) and EG modes. A single triangle/square LFO is provided and this can be directed to the VCO pitch or pulse width, or to the filter cut–off frequency. The contour generator is a simple instant attack/variable decay (AD) device with an optional sustain stage that converts it into an ASR generator, and you can direct this to the VCA gain, the VCO pitch or pulse width, and to the filter cut–off frequency with positive or negative polarity. However, the top panel controls only allow each destination to respond to one source at a time; you can’t (for example) sweep and wibble the pulse width simultaneously. Finally, the 13 miniature buttons provide one octave of pitch control, and a slew generator generates portamento. To the right–hand side of the Werkstatt ø1 you’ll find a header sporting 20 holes with all sorts of beguiling legends such as VCF In, VCF Aud In, VCO Out, and so on. The first five of these are CV Ins, the sixth is an audio input, and the remaining 14 holes are dual outputs for each of seven CV and audio Outs. The synth is supplied with five short cables (and you can purchase more) that allow you to patch this to that and, when you do so, you’ll find that the CVs applied internally are summed with those directed externally, which means that you can now both wibble and sweep simultaneously (or whatever else takes your fancy). You can also solder breakout cables to allow you to connect external devices to the ø1, but the optional breakout board (which should be available by the time that read this) is a much more elegant solution. Called the CV Expander by Moog, this can be installed quickly and easily by removing two of the original screws from the assembled synth, pressing the board into place and then, using two longer screws, fixing it to the casing. The board provides all 12 of the Werkstatt ø1’s inputs and outputs on 3.5mm sockets, so you’re now ready to rock and roll. Hang on a moment... Twelve inputs and outputs? The 20 sockets on the Werkstatt ø1 header carry 13 different signals. To cut a long story short, Moog had a problem with the CV Expander; should they make it larger and more expensive in order to reveal everything via 3.5mm sockets, or should they keep it neater and more affordable but lose something in doing so? A prototype with all 20 connectors was built but it was deemed too cumbersome so, finding that 12 sockets fitted precisely along the edge of the synth, they chose the latter option, losing the duplicated outputs (which, to be fair, can be replicated using multiples or ‘Y’ cables) and omitting the Trigger output, which was judged to be the least important of the 13. So, having fitted the CV Expander, I was now ready to test the Werkstatt ø1 within my existing analogue setup. Well, not quite. Not being an aficionado of atonal composition and the avant garde, I next had to calibrate the ø1 to play in tune with my other synths, which entailed removing the CV Expander and top panel to gain access to the trimmers on the motherboard. Had the unit been designed for integration with other synths when it was first envisaged — in fact, had the CV Expander been contemplated when the Werkstatt ø1 was designed — this would have annoyed me. But it wasn’t, and it hadn’t, so it didn’t. With a keyboard synth (in this case, a Roland SH101) sitting alongside the ø1, calibration by ear took just seconds and I was soon ready to reassemble everything, plug the quarter–inch output on the rear into my mixer, and play. Perhaps the most important thing to remember about the Werkstatt ø1 is that it wasn’t originally envisaged as a commercial synthesizer. 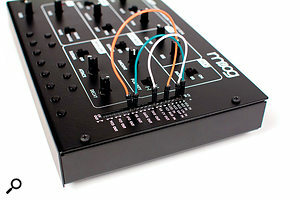 Indeed, once the idea of the Moogfest workshop had been approved by the powers–that–be at Moog, the company’s engineers had just a handful of weeks — as opposed to the many months or even the years that it has taken for some synths to gestate in recent times — to design and manufacture the kits for the festival. Consequently, it has quirks that may not have survived the development meetings and evaluations that would otherwise have been held, and it’s a credit to Moog that it’s as slick and as appealing as it is. The board layout is neat and tidy, and the finished unit is reassuringly solid, with a clear and attractive control panel. So, while that may not have been the original brief, it certainly has the look and feel of a carefully considered commercial product. 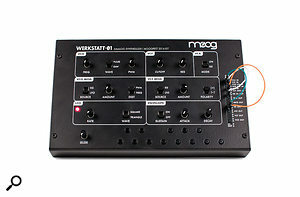 Moog have done their best to make the Werkstatt ü1 as straightforward as possible to construct, with no need for soldering on the clearly labelled circuit board.Although the Werkstatt ø1’s specification is a bit sparse by the standards of most performance synths, it’s not much different from some of the simpler, but still widely respected, single–oscillator synths from the 1970s and early ’80s. Consequently, I wasn’t surprised to find that I could conjure a wide range of interesting sounds from it. Sure, its character isn’t the same as a single–oscillator patch on a Minimoog, nor even a simple patch on something modern like a Minitaur, but that shouldn’t deter you. For example, it excels at bass patches based upon a PWM’d pulse wave. Dial in the fastest Attack and a moderate amount of Decay, then direct the contour to the VCF cut–off frequency, and all manner of classy sounds await. At the other end of the spectrum of coolness, the sawtooth wave allows you to create some surprisingly usable solo brass patches; just add reverb and no–one will know that you’re playing a box little bigger than a VHS video tape. Divert the LFO from the VCO to the VCF and flutes emerge. Alternatively, wind the modulation rate up into audio frequencies, and you can experiment with AM and FM to generate all manner of whacky effects. I played these through a Space Echo, and it was low–budget 1960s sci–fi all over again. Of course, the 13–button keyboard is a huge limitation if you try to play the Werkstatt ø1 conventionally, and this is where the expansion board starts to prove its worth. Having calibrated the ø1 to respond correctly, you can plug the 1V/oct CV output from a suitable keyboard synth into the Moog’s VCO EXP FM In and its Gate output into... well, um, where’s the Werkstatt ø1’s Gate In? This is an oversight, because there isn’t a Gate In. But don’t worry, there’s a workaround, and we’ll come to that in a moment. Before we do, you have to remember (again) that the Werkstatt ø1 was conceived as an educational tool, not as a performance synthesizer. Consequently, Moog’s engineers felt that anyone wishing to hook it up to a larger system would have a spare contour generator knocking around somewhere to control things such as its VCA Gain. This preconception was further reinforced by a belief that people would always want to apply more complex shapes to the VCF and VCA than they could obtain from its simple AD/ASR contour generator. Of course, they were wrong on both counts, because the Werkstatt ø1 makes a super little synth just as it is, and it works beautifully when arpeggiated. So what’s the workaround? The secret lies in the fact that the AD and ASR contours are generated by slewing the trigger and gate pulses (respectively) generated inside the Werkstatt ø1. (That, by the way, explains why the Attack has to be at its fastest to get a sound out of the AD mode.) Happily, the signal from the Gate Out socket is extracted before the slew generator, so you can apply an external Gate to this whereupon the internal and external voltages will be passively summed and the result will generate the contour. In practice, I found that this didn’t always work as expected because, when I directed the CV Out and Gate Out from my SH101 to the VCO EXP FM In and Gate Out of the Werkstatt ø1, I could use the Moog as a conventional expander only if I held down a keyboard button while applying the external CV+Gate signals. This turns out to be a consequence of the electronics of the two units. Although the Roland generates a very healthy Gate of +10V or more, it doesn’t ‘push’ the signal into the receiving device very hard, and may not trigger it. Other synths will generate lower voltages (typically in the region of +5V) but drive the ü1 without any difficulties. Either way, it’s not hard to obtain the desired results once you work out what’s going on. Just bear in mind that, as it says in the manual, mixing signals at an output may result in unpredictable behaviour. My advice is to treat this workaround with caution; although it works, the Gate Out wasn’t designed for use as a Gate In, and the Werkstatt ø1 isn’t going to thank you if you shove unexpectedly large signals into inappropriate little holes. Going in the other direction, you can also use the Werkstatt ø1’s CV and Gate outputs to control other synths and, while that might seem daft, I can imagine that it could be attractive for live use in highly constrained spaces. To test this, I directed the Moog’s outputs to the SH101’s CV and Gate inputs, only to discover that the CV range generated by the button keyboard extended from 0 to +3.76 V over its single octave! So I placed a passive attenuator (in this case, a Korg KVP001 swell pedal because that was the most convenient device that I had to hand) between the two synths. Once the pedal was adjusted correctly, the SH101 played perfectly in tune and, after a false start with the gating that I wasn’t later able to replicate (a dodgy cable, perhaps) everything worked perfectly. So, with a small square of sticky tape ready to hold down the Werkstatt ø1’s bottom ‘C’ button when needed, and an attenuator following its KB CV Out, I placed it (together with the SH101) in front of my Analogue Systems Integrator, whereupon it added genuine Mooginess to another manufacturer’s modular system. This was great fun, and begged comparison with the MF101 Moogerfooger, because I was now treating the Werkstatt ø1 in part as a patchable Moog filter, albeit one bundled with a bonus VCO, LFO, VCA and EG — and it did a fine job. In truth, many of the projects are very simple, and they should daunt no–one who can complete a jigsaw or wire a patch cable. For example, the Dual Oscillator mod (which converts the LFO into a key–tracking audio oscillator) requires nothing more than a couple of potentiometers and a single resistor connected via the I/O header — there’s no soldering on the board itself. Likewise, the Second Oscillator project (which uses the old trick of employing a 555 clock/timer chip as a simple oscillator) should be practical for anyone who can insert components correctly into a breadboard. Other projects are more advanced and some, such as the Push Button Vibrato and the Arpeggiator/Sequencer, require the addition of the (remarkably affordable) Arduino Uno microcontroller board and the ability to upload simple code to it. But that’s as it should be; the Werkstatt ø1 allows you to start at a basic level, and then helps you to work through progressively more complex projects to obtain a better understanding of synthesizer electronics and operation. You can even download the 3D printer files provided on the web site to create dedicated housings for some of your completed projects, and that’s a very nice touch indeed. This is what your completed Werkstatt ü1 should look like.For experienced engineers, Moog have provided a 16 x 6 array of solder points (Experimenters’ Pads) on the Werkstatt ø1’s circuit board and this allows them to add circuitry within the synth itself. There are also numerous test points and jumper positions that allow advanced hackers to insert or extract signals of their choosing. But if you’re unsure of your skills, I advise that you leave these alone. You can do significant damage if you poke around the insides of any synthesizer with an unruly soldering iron. 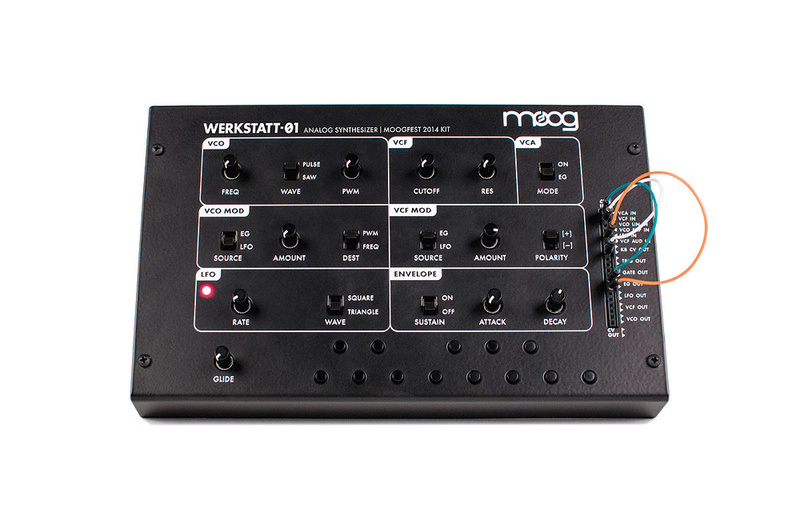 Moog released the Werkstatt ø1 in its current form — quirks and all — because their customers demanded it. I suspect that there were vague thoughts beforehand that its underlying technology might lead somewhere interesting, but there had been no plans to turn the Moogfest kit itself into a commercial product, and I think that the company was genuinely surprised at the level of interest it generated. Unfortunately, some people seem to have lost sight of this, and have been discussing the Werkstatt ø1 primarily in terms of a mainstream synth module and as a low–cost entry into modular synthesis. Sure, it can be used in those roles, but it would probably fall a little short if they were its sole raisons d’être. But if your interest reaches beyond performance and you fancy delving into the underlying concepts and the electronics of analogue synthesis for the first time, the Werkstatt ø1 is an ideal starting point. You’re going to learn far more from it than you ever will from twiddling knobs on a conventional, integrated synth, and it’s going to sound surprisingly good while you do so. From a position of drought not many years ago, there’s now a flood of small analogue (and analogue/digital hybrid) synths–in–a–box available, although no other that I know combines the precise set of features, the sound or the ‘modability’ of the Werkstatt ø1. For example, I’ve seen people compare the Werkstatt ø1 to the synth section of lower-cost alternatives such as the Korg Monotribe, but this is a mistake because it falls into the trap of thinking of it as just a small performance synth. A more valid approach might be to compare it with a kit such as the now defunct Mutable Instruments Anushri, although that, like the Korg, adds drum sounds and a simple sequencer to the equation and, like the Korg, has a very different sound (in this case, courtesy of a digital second oscillator, a 12dB/oct filter, and a distortion effect). Another alternative might be something like the fascinating and obscure Atomosynth Koe Desktop V2 or any of the do–it–yourself Eurorack modules that have appeared in recent years. But comparisons such as these are only appropriate if you’re already competent enough to build a working synth from component level upward, which is not where the Werkstatt ø1 is targeted. The fact that each of these synths offers a unique combination of sounds and facilities is yet more proof (if any were needed) that we live in a golden age of analogue synthesis. Here’s a list of the Werkstatt projects available at the time of writing. Add a second LFO using a voltage-controlled clock chip. Introduce synthesizer control based upon movement. 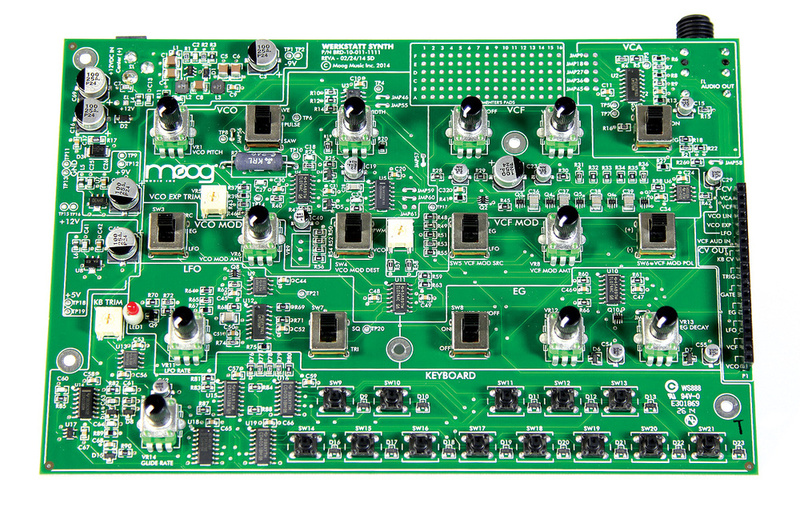 Apply a microcontroller–generated note sequence to the VCO input. Convert the onboard LFO into a second audio oscillator. Add a VCO fine–tuning control. Add programmable LFO rates for each note in the octave. Add a digitally generated noise source. Control the VCF using hand movement. Add a pot to control the VCO pitch. Introduce the concepts of aftertouch. Add a simple volume control. If you fancy undertaking some of the projects but are worried about sourcing all of the components individually, there’s an online store — SparkFun Electronics, based in Boulder, Colorado — that sells a dedicated Werkstatt ø1 kit. For just $30, this includes a miniature breadboard, suitable resistors and capacitors, trimmers, push–buttons, LEDs, a photocell, a pressure–sensitive potentiometer, and additional jumper wires. 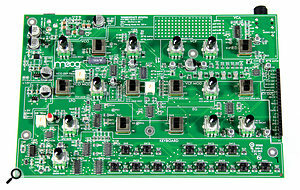 They can also supply the Arduino Uno microcontroller board used in some of the more advanced projects. You can place orders online and international shipping is available so, while it may not be the cheapest way to get started if you’re in the UK, it’s almost certainly the most convenient. Sawtooth or pulse wave VCO (the latter with PWM), plus Audio In. VCA with contoured and ‘On’ modes. Triangle or square wave LFO. One octave played using miniature buttons. Audio Out (quarter–inch), Audio In (mini–jack), plus 12 further patch–points. 12V DC from universal (100 240 V, 50Hz/60Hz) wall–wart. It sounds far better than you might expect. Novices who undertake the projects will learn a lot. With a little thought, it can be integrated into larger analogue setups. Obvious limitations as a stand–alone synth. The Werkstatt ø1 will appeal to people for whom synthesis is less about trying to play widdly–widdly solos, and more about customising and extending the capabilities of their instruments. Sure, it’s unlikely that you’ll ever create a truly new sound using a modified Werkstatt ø1, but the knowledge and skills you’ll acquire in trying to do so could be worth a great deal, whether as a hobbyist or as a student. As wiser people have said before me, it’s not always about the destination; it’s the journey that counts. £249.00, CV Expander £34.99. Prices include VAT.